Caught a bit of Trial By Kyle and wasn’t impressed. He’s so cringeworthy and doesn’t resemble any credibility (and that’s putting it kindly). I love Judge Judy because of her funny yet credible, professional demeanor, everything Kyle is not. If they wanted a TV star to do it then it should’ve been Gina Liano (doesn’t she have a law background) or Gretel Killeen. 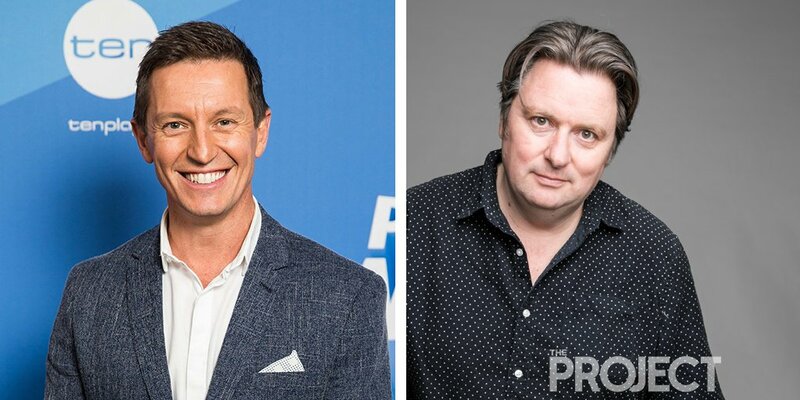 Rove’s interview on The Project “we can’t get into the studio until 2 o’clock tomorrow because The Living Room needs it tonight”. Lots of positive comments again tonight for Dave, though that won’t necessarily translate to ratings on a Friday night unfortunately. Pretty sure they tape The Living Room on Wednesday (unless it has changed due to Family/FeudPointless). Just caught up on Trial by Kyle, I hate to admit, but I actually enjoyed it, haven’t checked out the ratings but it seems alright. Dave was funny, a few editing with the scripts and you’ve got yourself a cracker! There clearly is a second episode of Trial by Kyle. Any word from Ten about if or when that might air? Not necessarily, they probably went into the studio and filmed a bunch of cases then chose the best ones for the final edit. The two teasers could just be the cases that didn’t make the cut but that doesn’t mean there is a whole second episode there. Dave was good in content, but for me it was hard to switch off and go with the flow of the premise. In this universe Dave Hughes, Glenn Robbins, Brendan Fevola exist as themselves. Dave Thornton, Dilruk, and even Emily Taheny to an extent, however, exist as fictional characters. If you’re going to have some people exist as themselves but then some also as equally recognisable people exist as characters, it made it hard to suspend disbelief and keep up with which famous people existed in Dave’s universe and who didn’t, at least in my house. Okay show though, would try a second episode. Trial By Kyle was #2 in 16-39… Should it have got higher TP off Bachelor… Maybe, but I think that demo result is pretty decent. I agree with that. I feel like it was a cross between Extras and an Aussie Curb Your Enthusiasm but not as multi layered. If you’re going to have some people exist as themselves but then some also as equally recognisable people exist as characters, it made it hard to suspend disbelief and keep up with which famous people existed in Dave’s universe and who didn’t, at least in my house. It’s been done before though with shows like Extras and Episodes. What sort of total people numbers do you think Rove’s Pilot will do… over 400,000 ? Sub ~350k at best, the audience just isn’t there currently but that doesn’t mean they shouldn’t be trying to reverse that trend with audiences not tuning in. The show would need some time to bed in and for people to find out about it if they picked it up for a series following good feedback about the pilot tonight. I’m all for the idea of Roves Saturday night show but let’s be honest the audience isn’t there and I don’t know if it ever will be there on a Saturday night again. If FTA cant get people tuning in to programs on a Wednesday night they’ve got next to no chance of getting them to tune in on a Saturday. I hope I’m wrong. Rove should have a Sunday night show, consistent for most of the year anchoring the post reality slot… could help solve a lot of TENs challenges on that night. As for Dave… why did they bury that on a Friday night. Arguably more potential than any of the other shows they aired as part of pilot week. They should repeat it behind Russell Coight on Sunday night at 8. Dave was the lowest rated show of Pilot Week so far with less than 250k tuning in.